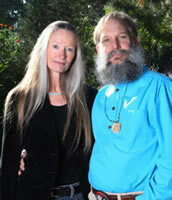 W. MICHAEL GEAR holds a master’s degree in archaeology and has worked as a professional archaeologist since 1978. He is currently principal investigator for Wind River Archaeological Consultants. KATHLEEN O’NEAL GEAR is a former state historian and archaeologist for Wyoming, Kansas, and Nebraska for the US Department of the Interior. She has twice received the federal government’s Special Achievement Award for “outstanding management” of our nation’s cultural heritage. Their First North American series hit the international as well as USA Today and New York Times bestseller lists. They live in Thermopolis, WY. CLICK HERE FOR MORE BOOKS BY THE GEARS. North America’s Forgotten Past — (1990- ) Publisher: Thousands of years ago, small hunting bands crossed the fragile land bridge linking the Eurasian continent to the Americas and discovered a land untouched by humankind. Over the centuries that followed, their descendents spread throughout this land. Bestselling authors and award-winning archaeologists W. Michael Gear and Kathleen O’Neal Gear bring the stories of these first North Americans to life in this magnificent, multi-volume saga. In the dawn of history, a valiant people forged a path from an old world into a new one through what is now Alaska and the Canadian Northwest Territories. Led by a dreamer who followed the spirit of the wolf, a handful of courageous men and women dared to cross the frozen wastes to find an untouched, unspoiled continent. CLICK HERE FOR MORE NOVELS OF NORTH AMERICA’S FORGOTTEN PAST. 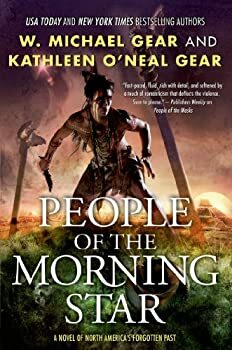 People of the Morning Star, by the archaeologist couple Kathleen O'Neal Gear and W. Michael Gear, is pretty interesting once it gets going. It is set in the Native American (Mississippian) settlement of Cahokia, a city located near modern-day St. Louis, whose population in the 1200s would have made it one of the largest cities in the world. In this book, Cahokia is ruled by the Four Winds clan, led by the Morning Star, a god incarnated into the human flesh of Chunkey Boy, a Four Winds clan youth. The social structure of Cahokia is highly stratified; the most favored clans rule the others, with merchants and traders having less status, and "dirt farmers" having the relative status of peasants or serfs. Anasazi Mysteries — (1999-2001) An all-new series, featuring a seamlessly integrated blend of ancient history and intriguing mystery that could only come from the international and USA Today bestselling authors of The First North Americans series. Award-winning archaeologists Kathleen O’Neal Gear and W. Michael Gear have enriched and entertained an avid international audience of millions with their rousing historical epic of the pre-Columbian peoples of North America. Now these master storytellers turn to the American Southwest, to one of the most enigmatic people to ever inhabit this continent–the Anasazi. At its pinnacle in A.D. 1150, their empire was vast and sophisticated, unequaled until the arrival of the Europeans. Dr. Maureen Cole, one of the world’s foremost physical anthropologists, has been called in to examine and evaluate a mass grave discovered in New Mexico. The burial site contains only the shattered skulls of women and children. Dr. Cole is appalled at the find and begins working immediately to unravel the mystery of these deaths. But as she works, strange things begin to happen around her. Little incidents at first, then her generator quits, and she begins to hear whispering voices emanating from the plastic bag of bones. In the nearby canyons, just a scant few moments ago in geologic time, a series of brutal murders has terrified the Katsinas’ People. Their war chief, Browser, wanders the canyon rim at night, alone and terrified, searching for the killer. Eight women have been savagely murdered. Their bodies were dragged through the village, then disappeared. Browser desperately turns to the crazy old man they call “Stone Ghost.” They say he has powers, but Browser has secrets he dare not allow anyone to reveal–even if it means that everything and everyone he loves will fall in the path of a ruthless murderer. Is the barrier between one time and another merely a construct of perception originating in the human mind? Whatever it is that separates the past and the present has grown perilously thin as a killer stalks helpless victims in two different centuries. The Visitant brought all sorts of family vacation memories to my mind. It reminded me of all the times I’d hiked through the ruins of Mesa Verde and imagined all the people who had worn those same rocks smooth hundreds of years ago. That’s part of the power of the book. It takes people back in time to revisit portions of their own lives, and back to the time of the Anasazi.